Canoeing at Elan Valley Lodge CanoeingElan Valley Lodge have exclusive access to the Caban Coch reservoir for water-sports, including; Canoeing and Kayaking. It is a fantastic way to explore the spectacular scenery of the surrounding estate. 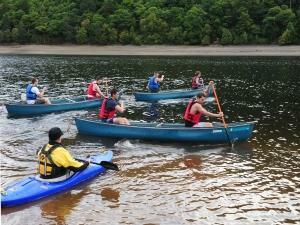 Elan Valley Lodge have exclusive access to the Caban Coch reservoir for water-sports, including; Canoeing and Kayaking. See the website for dates for our Open Activity Weekends which extend the opportunity to individuals. Canoeing and Kayaking, during our Open Activity Weekends: Adult £15. Child £9.50. See the website for more details.